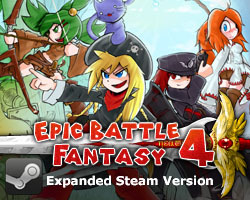 Hey guys, it’s time to begin translating Epic Battle Fantasy 5, and it’s gonna be a huge project! I think the total word count is over 50,000 words, so it’s the size of a small novel. This is purely volunteer work, as I couldn’t pay enough to translate that many words, but you’ll get a few copies of EBF5 out of it. What I’ve done in the past is have 1 or 2 people translating for each language, and another 2 or 3 proofreading it and making suggestions. We’ll be working on this over October and November – hopefully 2 months is enough time. I don’t know much about these new languages yet, so feel free to give me a quick intro about dialects and other problems that we might run into. If you want to help out, shoot me an email at kupo707@hotmail.com. • What language and dialect you want to do. • Whether you’d like to translate (more work) or just proof read. • Link me to some paragraphs you’ve written in English (a blog or something), so I know you’re fluent in English. • Let me know how much free time you have, especially if I may need to replace you later. • You’ll have to be quite familiar with my games, the characters, and the style of humour. 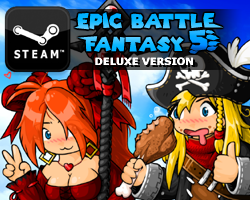 • It’s best if you’ve played a few hours of the EBF5 beta. • For legal purposes, you’ll have to agree that your translation can be used in every release of EBF5, and possibly in future games, indefinitely, and that you own no part of EBF. I’ll start preparing the translation notes and I’ll get back to you soon. Translators who have worked on the previous games will get priority. Also if you’ve played an EBF4 or BH2 translation before, now’s your chance to give feedback on how we can do a better job this time! Common criticisms in the past were about dialects, and translations being too literal sometimes. It’s also possible I may consider more languages in a future update, so suggestions are still welcome. This entry was posted in Epic Battle Fantasy 5 on September 23, 2018 by Matt Roszak. Hello, I am another Korean that wants to volunteer for Korean translating. Maybe we can work together. I already sent an application email. What do you think? The game’s essentially released. You can play everything in it right now. Seems scummy not to pay the translators when you are making money off their work. You should just release the game. Nobody forces them to do the translation. Also, they will get free game copies. That’s literally what volunteer work means. Oh boy…as a native Polish speaker I can tell that translating EBF5 will be incredibly tough for that language. The game’s “meta” nature (directly referring to game mechanics and other meta stuff) would work poorly in Polish. Still, good luck. If there’s not too many volunteers, I may try to give a hand. How many copies of the game does each translator get? One for each translator, plus possibly more giftable copies, I assume/hope? So all the dungeons and the content you can pay for will only be available once the game is released on stream, which we have to wait 2 months for? You can get it sooner on my Patreon, but otherwise yes. Aand if I get it on your patreon will I be able to get it on steam as well? If you give me at least $15, yeah. I can translate the game into Vietnamese, Matt. Are the languages mentioned above the only ones we can select from? I’m from Vietnam and can;t belive this. I may help you! I’m french and i haven’t an incredible level in english but, I already have translated videos on youtube so I think i’m not bad, and I really would like to try to translate the game in french, I don’t know if can do it entirely, but if i can help, it would be a pleasure. It means: I am french and I do not have a very developped English but I have already translated videos on YouTube so I think I am not bad, and I would really like to try to translate the game in french. I do not know if I could do it entirely by myself, but if I can help, it would be a pleasure. Je ne veux pas être impoli, mais tu devrais vérifier deux fois ta grammaire avant, Octave, pour éviter les imprécisions. Is there only one shop’s worth of equipment avalible? Redpine has the same stuff as Hope Harbor. Nothing added, nothing lost outside of what I have bought. Nice there’s more languages this time. I might be able to translate into Simplified Chinese as I have access to Google where I live. Although I still have school so I might only be able to do a little bit. I have played till Poseidon on the beta and I’m also interested in helping for the free copyas I need to translate a piece for my Chinese class but I don’t really think my language is good enough to translate so I could also proof-read. Translations over October and November… So release sometime near Xmas? Or is it close and the translations would be a kind of patch? Would you mind what other languages you’re considering ? I might be able to help . Why Vietnamese tho? It’s dumb and unimportant.